I am back talking with Eva from Wellacopia about how chronic illness shapes and factors into our life choices. Monica Michelle (me) has Ehlers Danlos, Fibromyalgia, Mast Cell Activation, and POTS. 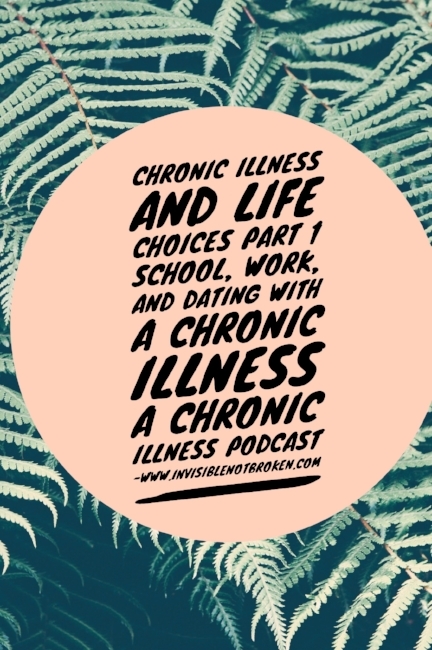 In this first episode, we talk about chronic illness and high school, factors to consider when you are a spoonie choosing a college, and a long chat about dating when you have an invisible illness. In the comments please tell us about how chronic illness has affected your life choices or any tips you have. Invisible Not Broken has a Patreon account. If you would like to and can support the podcast thank you! You can do so by clicking here. We are a year old this month! Last month we had 11,000 downloads that is entirely thanks to all of you. The best podcast birthday present you can give Invisible Not Broken is to share us with friends, family, and support groups.